Brixton is a diverse town in the South of London. Home of the famous Brixton Academy, it is a town immersed in culture. The Brixton market has imports from India, Vietnam and South America, as it is a diverse and unique place to shop. Whether you are looking to celebrate a special occasion or you plan to enjoy the nightlife of Brixton, Hire Hummer Limo can help you. Hummer Limousine Hire Brixton has a professional and pleasant service. Should you decide to hire a limo, we make it easy for you. Our friendly, certified team of chauffeurs will make sure that you have no worries about directions and other anxieties that can come with planning a trip. Hire Hummer Limo is also compliant with the VOSA laws. This means that we have taken extra measures to ensure safety and security for our clients. Each of our limousines for hire have been checked individually and are ready to take to the roads. Hummer Limousine Hire has a large selection of vehicles available, ranging from the Baby Hummer car hire to the gigantic Hummer 8-wheeler hire. We also have an abundance of interior features that are designed either for entertainment or relaxation. For example, there are a number of lighting options; one can choose between strobe, laser and disco lighting. A full-length drinks bar is available, and as with all of our Hummer limousines for hire, flat screen televisions, CD players and DVD players can also be found inside. The Hummer H2 limo hire is a born classic. Its distinguishable exterior is known all over the world and it is still growing in popularity. This limo for hire is rather popular with those celebrating weddings, as there is a certain regal quality to the appearance of this vehicle. The H3 is Hire Hummer Limo’s latest edition in the H series. With a smooth, refined looking exterior guaranteed to make a lasting impression, people from all walks of life can appreciate this limo for hire. This is quite a contemporary vehicle and appeals to the more fashionable clients yet it can accommodate almost any group. The Hummer H3 limo hire is our most versatile limousine for hire. 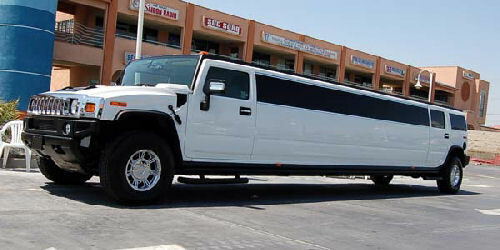 For those who intend to cause a stir, the immense Hummer 8-wheeler limo hire is sure to do the trick. It is the ultimate party vehicle, with a VIP room in the rear and the space to fit up to 16 people comfortably, with room for festivities! If you want to make a big entrance, it doesn’t come much bigger than this limo for hire. 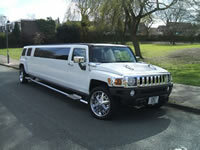 Hire Hummer Limo has all the details and a wider selection of vehicles at Hire-Hummer-Limo.co.uk. Please visit the website if you have any queries.